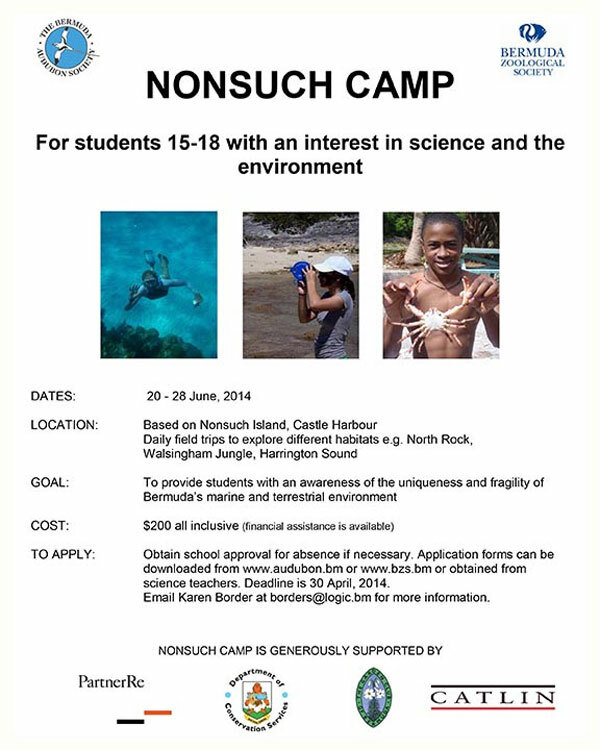 The Bermuda Zoological Society [BZS] will host a “Nonsuch Camp” for students of aged 15 to 18 with an interest in science and Environment from 20- 28 June 2014. Based on Nonsuch Island, the camp will be field trips to explore different habitats such as North Rock and Walsingham Jungle. This camp will provide students with an awareness of the uniqueness and fragility of Bermuda’s marine and terrestrial environment. The cost will be $200 all inclusive, and if needed financial assistance is available. Application forms can be downloaded from audubon.bm or bzs.bm or obtained from science teachers. The deadline of the submission of form is 30 April 2014. Please email Karen Border at borders©logic.bm for more information.